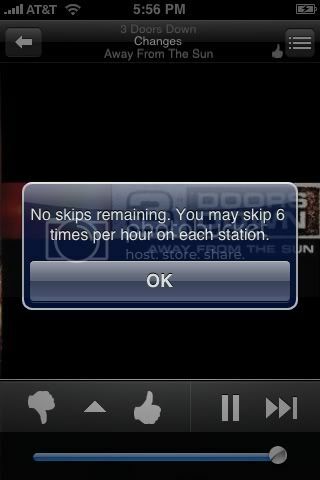 Pandora Radio: The BEST Application for iPhone 3G/iPhone v.1 with 2.0 firmware. This is my first time writing a review for an iPhone app, partly because I just received my 16GB Black this past Friday and partly because Ive been basking in the glory that is the App Store, and I couldnt think of a more deserving app than Pandora Radio to review. For those of you who have never heard of Pandora Radio, Im sure youre wondering what it is exactly and why I would make such a bold statement in my title. Allow me to enlighten you. To put it lightly, Pandora Radio is a heaven-sent program/application that will allow you to stream music that youve never heard of but probably should have, music that you listened to many moons ago but somehow let slip into obscurity with those passing moons, music that is probably still in your current rotation in iTunes, and anything in between. Not too shabby, eh? You might ask, BaLLi5t1c, how does it do all of that without me hand-picking all of the artists and songs that I want to hear? The logistics are anything but simple and I wont even pretend to understand all of the intricacies but if I were to hypothesize, I would have to guess that it boils down to old-fashioned voodoo magic. Ok, I admit Im no scientist and my hypothesis is far from accurate but if you do want more detailed information on this truly spectacular process I would advise checking out Pandora Radio - Listen to Free Internet Radio, Find New Music for an overview and FAQ for an in-depth explanation (other than voodoo) of how it all works. 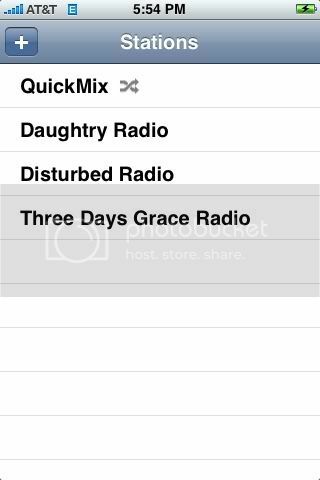 As soon as I installed the app, I clicked on Create a Station and typed in Three Days Grace as the artist I was interested in. The first song that played was, as you might have guessed, by Three Days Grace. 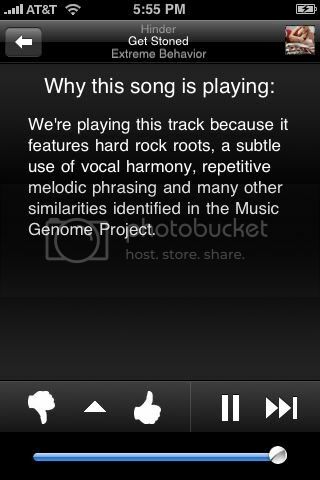 I enjoyed that song so I hit the thumbs up icon but wanted to delve further into what this handy-dandy app could offer. I hit the next track button and a song played that I had not listened to since back in 2006 when I played it several times a day for at least a month (10 Years Wasteland in case anyone was curious). By that point, I was seriously intrigued but wanted to see what else this puppy could do. I hit thumbs up and then went to the next track and I couldnt believe my ears. Disturbed Stricken fired right up which coincidentally happened to be the artist whose newest album had been playing in my car non-stop since I purchased it several weeks ago. That was when I thought to myself, Get out of my head, then after realizing what I had stumbled upon, immediately retracted that thought and clicked next track. Ive not looked back and I couldnt be happier. The icing on the cake? Its ABSOLUTELY FREE! The layout is pretty straight-forward and I dont anticipate anyone having issues navigating the menus/using the app itself but if you do and don't feel like perusing through the site or FAQ for your concerns, I'll do my best to answer any questions you might have right here. As you can see in the screen shot below, all of your current stations are listed (determined by what you search for using the "+" in the left-hand corner) and there's a "QuickMix" station which basically melds all of your tastes together and samples them accordingly (Note: Stations included in the "QuickMix" can be edited from the site listed above). Once you're actually listening to a station, you'll be looking at a very eye-catching screen with various options allowing you to manipulate and refine your experience even further. In the screen shot below, you can see the "thumbs down/up" buttons which are pretty self-explanatory meaning that you either like the song or you don't and WILL have an effect on future choices presented to you through this application (read more on the impact your actions have in the FAQ listed above). There are also options to bookmark the song and/or artist and even purchase the song via iTunes which can be accessed by clicking the little up arrow between the "thumbs down/up" buttons. If you are curious as to why a particular artist/song was chosen for your listening pleasure, you can click the button in the right-hand corner (kinda looks like a few bulleted lines) and it will bring up an in-depth explanation that may or may not go right over your head but it's comforting to know that the selections aren't just lucky guesses. To ensure that users are actually rating the music/not just browsing for the sake of browsing, you're limited to six (6) skips/next track selections per station per hour. So, if you have multiple stations with similar artists you can workaround this in a sense because you get six (6) skips on each per hour. Note: If you hit "thumbs down" on a song, it will stop playing and go to the next song. This is considered a "skip" and will count towards your allotted six (6) per hour. -	Accuracy with which it picks and chooses artists/songs based on your tastes is simply astonishing. -	Quality of the streams is definitely above-average and will please practically anyone utilizing this incredible app. -	Speed of streaming is quite impressive. My first encounter with the app as recounted above was on the EDGE network and the load-times were definitely tolerable then. On 3G and Wi-Fi, youll be going through songs at almost the same rate as you would by clicking Next in iTunes. -	Cover-Art/aesthetics when youre actually listening to a song is top-notch. -	Easy-to-navigate menus and two volume controls based on your access to the device (on-screen slider and dedicated volume keys on side of the device). -	Seamless integration with your account via Pandora Radio - Listen to Free Internet Radio, Find New Music and the ability to access all of the same features and then some while on the site. -	Playback volume leaves a bit to be desired when just listening via the external speaker making it difficult to entertain multiple people in the same room without huddling around the device. -	The initial menu where all of your stations are listed is almost too simplistic visually. Its not that it doesnt do the job but it pales in comparison to the view you enjoy once youre actually listening to one of your stations. -	Inability to edit/remove bookmarks and re-name stations unless using the online portal (Pandora Radio - Listen to Free Internet Radio, Find New Music) slightly tarnishes the otherwise brilliant experience. -	Makes you want to worship your shiny Apple toy more than you already do!!! Excellent review Ballistic. 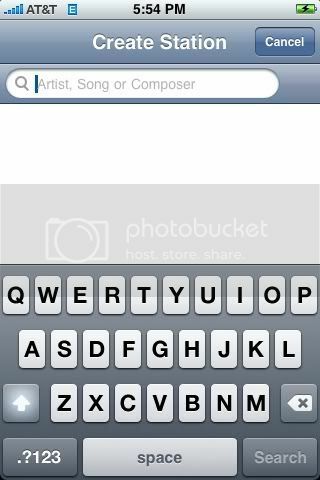 I too love Pandora..
One question, do you know what it means to bookmark a song? I bookmark them, but I don't know what benefit it provides? Btw, thanks for the discount! I was pretty optimistic when I put that much effort into it but when I didn't receive a response right away I got worried. Needless to say, patience is a virtue. TheiPhoneBlog is THE place to be for iphone news and reviews!